I’ve never been to Scotland (it is on my list). I might have some Scottish heritage, I’m not really sure. I certainly wasn’t raised with any connection to the culture. 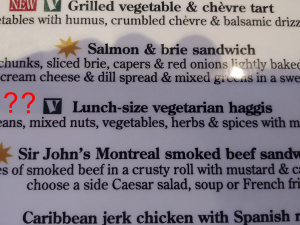 Thus, it’s really not for me to say…but um…vegetarian haggis? According to Merriam-Webster haggis is “a traditionally Scottish dish that consists of the heart, liver, and lungs of a sheep or a calf minced with suet, onions, oatmeal, and seasonings and boiled in the stomach of the animal”. From what I understand the actual stomach is optional, by present-day standards. But, just like calling it cheese doesn’t make it so, I’m pretty sure removing the meat makes it, well, not haggis. This is not intended as a dig at vegetarianism or any other diet choice. It's a dig at the incongruous naming of food items. The pub this menu belongs to is very nice. The food was good, so was the service, and this dish (whatever you call it) is probably tasty. I can’t vouch for it specifically as I opted for fries and deep-fried pickles.